The day has come for Ayumi’s big move to city life in Saitama. More than her friend, not quite her sweetheart, Hashio sees her off with his true feelings buried deep in his heart. As the truck pulls off, the heartache written on Ayumi’s face summons back the memories of that day, the words he couldn’t say. Alone on the dusty country road, Hashio slips into quiet melancholy. Before he knows what he’s doing, he finds himself running full-tilt after her! Chase after Ayumi’s moving truck as fast as you can. The country road is unpaved, so the truck will occasionally bounce as it hits bumps and stones. Thanks to slipshod packing, every time the truck gets jostled, one of the items will come loose. Avoid the items that fly off the truck and other road obstacles, and keep up the chase until Ayumi notices you. Move left and right using the arrow keys and jump with the space bar. Hashio’s speed matches that of the truck, so even just running will wear down his endurance little by little. Colliding with luggage and obstacles will damage him considerably. A few items like rice balls and sports drinks will replenish Hashio’s endurance, so be sure to collect these whenever possible. It’s OK to run under a bounding object, but jumping over it will net you extra points. 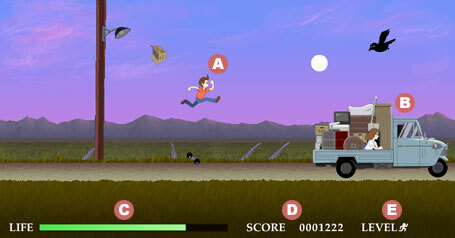 The closer you are to the truck, the more points you will get from jumping obstacles or running. 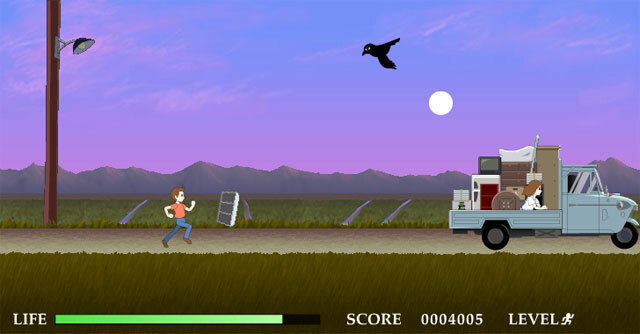 The only path to a high score is to face the danger and get up close to that truck! A boring, unremarkable young man, he lacks the courage to strike out for a big-city university, so instead he’s just planning to take over the family farm. However, he comes from a long line of swift runners, and in fact there’s not a soul who can outrun him. It’s a pity he himself has yet to realize this. The village idol, with the figure, face, and grades to match. She got into a top-ranked college and is moving to the city. It’s one of life’s great mysteries as to what she sees in Hashio.